Private or semi-private tour from 2-6 guests ONLY. Specially designed Houseboat. Enclosed with heated (in winter) exploring and swimming with manatees in several springs. Snacks, hot & cold beverages. Between April 1 - November 15 an In-Water guide will only be on the tour with you if you pre-purchase the Ultimate In-Water Experience, we do this to keep our tours as private as possible. Over the years my company has developed a reputation for customer care, cleanliness, friendliness, trust, timeliness, and dedication unmatched by any of the others in the manatee snorkel tour business. 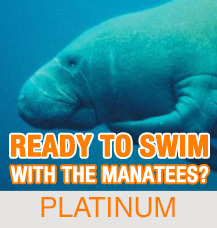 Our Ultimate Manatee Tour is priced at $99/person (plus applicable taxes). We require a minimum of 2 persons and have a maximum of 6 persons. Our tours last approximately 6 hours.